The one thing many fantasy football players will take away from Roethlsiberger’s 2012 season was that he missed three games. It’s easy to dismiss Roethlisberger as an injury prone quarterback, but he’s never missed more than four games in a season, and that was only due to his 2010 4-game suspension. When looking at Roethlisberger’s 2012 fantasy numbers, you’ve got to dig deeper than just his overall finish. He finished as the 18th highest scoring fantasy quarterback in standard scoring leagues, which in the end equate to QB2 numbers. But Roethlisberger did miss three games, and if you take a look at his weekly average ranking, he scored 17.22 fantasy points per week. Only 11 other quarterbacks had a better weekly scoring rank than he did last season, putting him in the QB1 discussion. One of the other biggest knocks against Roethlisberger this off-season has been the loss of Mike Wallace, as well as the late season injury to Heath Miller. The Steelers let Wallace go because of cap issues, and they feel they’ve got a solid wideout in Antonio Brown and Emmanuel Sanders. In an attempt to give Roethlisberger some weapons, the Steelers drafted wide receiver Markus Wheaton, a player that has been compared to Wallace. If Miller isn’t able to start the season on time, that will be a big loss, as he’s such a large presence in their passing red zone offense. But the fact that the Steelers didn’t draft a tight end could be viewed as a positive for Miller’s recovery. 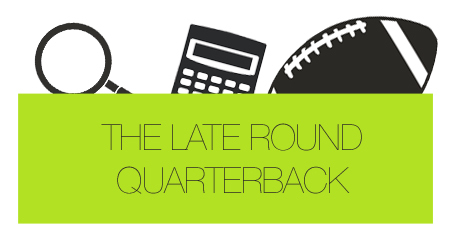 With Roethlisberger being devalued by many in the fantasy football community, it gives the savvy late-round quarterback disciples out there another quarterback to consider later on in the draft. If Roethlisberger can continue the season he was having last year, you should be pretty happy with him as your late-round QB1. Minus his first full season as the Cowboys’ starter and his injury-plagued 2010 season, Romo has finish the season as a fantasy QB1 each year of his career. When drafting in fantasy football, one of the qualities you want is consistency, and Romo, while it may be hard to believe, has been as consistent as you can get. When you look at the quarterback position, it takes a while for Romo’s name to enter the discussion. Eventually it does, and when it does, you should consider him for your QB1 spot. Being able to land a yearly fantasy QB1 late in your fantasy football draft will allow you to solidify your roster elsewhere, and still draft a potential top starter. It doesn’t hurt that Romo’s got one of the best receivers in the game in Dez Bryant, and should have a healthy DeMarco Murray in 2013. If they can fix their offensive line a bit, Romo could put together a nice season. Eli’s 2012 season will certainly be remembered for his up and down play. There was a three-week stretch in 2012 – Weeks 8-10 – where Eli scored 5.98, 3 and 2.7 fantasy points. Manning did come back from the Giants’ Week 11 bye week as a buy high fantasy target, and he rewarded owners that traded for him with a Week 12 23.16 fantasy point output, which was sixth best among signal callers that week. However, if you were counting on Eli to lead you to fantasy championship gold, you were let down. Weeks 15 and 16, the heart of fantasy playoff season in most fantasy football seasons, saw Eli score a measly 2.44 and 10.8 points. If Eli was your QB1 those weeks, the only way you were wining was if you had great performances from the rest of your team. Of course he made things even worse by scoring the third most fantasy points at the quarterback position in Week 17, which was useless to many. It may seem to you that I’m down on Eli, but that’s not necessarily the case. If I had to invest a high pick in Eli, I would probably pass. But his ADP for 2013, that of a QB13, is attractive. With an ADP like that, you’re not investing much in Eli, as you’re spending a late-round choice on him. One of the things that hurt Eli the most last season was not having his number one target, wide receiver Hakeem Nicks, healthy for the full season. Nicks is the type of player that can change games and dominate one-on-one battles, which is a great weapon to have if you’re a quarterback. It’s true Nicks has never played a full NFL season, but he did play 15 games in 2011. That season, Eli finished as the sixth best quarterback in standard scoring leagues. If Eli has a healthy Nicks to throw to, not to mention Victor Cruz, Brandon Myers, and an offensive line that just added some youth infusion in first-round rookie Justin Pugh, why can’t Eli make an appearance back in the upper echelon of fantasy quarterbacks? Even with his down season, 2012, Eli was still the 15th highest scoring fantasy quarterback. Imagine how his season would have turned out if he didn’t have six games where he scored 12 fantasy points or less? If you can forget about Recency Bias, as talked about by Phil Culbertson, you’ll come away with a great opportunity to snag a quarterback in a high octane passing offense with outstanding pass catching weapons. In fantasy football, that’s the exact situation you want your fantasy quarterback to be in.